Join the resident cheesemaker in making the locale’s signature Le Chalet cheese at this restaurant. 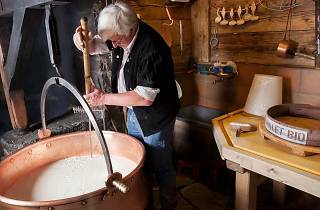 This village near Gruyères has an attraction sure to entice any fondue fan: cheesemaking! 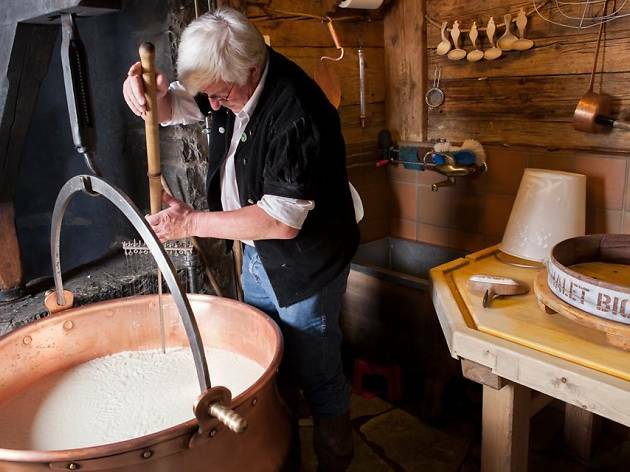 Join the cheesemaker in making the locale’s signature Le Chalet cheese in a cauldron over an open fire. A lot of stirring is involved, but once it’s fermenting (at a strict 32°C), it’s time to tuck into the fondue – a classic Vaudois moitié-moitié (half-half ) of Chalet and l’Etivaz cheeses. The event concludes with you hauling 10kg of cheese into a mould, which then cellars for four-to-six months. Mon-Thur, Sat, Sun 8.30am-6pm, Fri 8.30am-midnight. Cheesemaking: Wed-Sun 10.30am-12.30pm.